That was years ago. TRAMS isn't really in a position to acquire anything new at the moment but I'm not sure if this would be an exception or not. If they still have some left, I wonder if they'll sell them? Trolleys were temporarily taken out of service in Mendoza for an infrastructure overhaul but they were already outnumbered by locally produced units when that happened. Saw a video of one running posted on Facebook recently but I don't know if it's an old video or something recent. 1. Gas. TransLink doesn't seem to be interested in diesel cutaways anymore since they were buying gas Chevys and GMCs when the 4500 diesels were still being made. 2. Not sure. Might be too expensive. This is the process ABC uses. If anyone wants to see what a bus looks like in two pieces, here are some photos I found on Instagram I'm sure if you browse through some older posts in this thread, you'll see more photos of how buses get picked at. 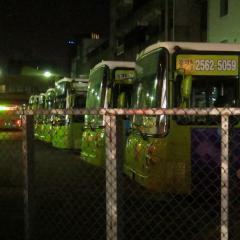 Some are already in service. Those of you in WCTL will find this photo familiar. Action shot of a 19700 in service at Bridgeport last week. Looks like the Ford Transit is TransLink's new platform of choice for Girardin MB-IIs. Not sure if previous sets had these but this one (and presumably others in its set) has a reverse buzzer instead of a reverse alarm. I was wondering where that strange buzz was coming from until I saw it backing up. Isn't 69 still undergoing major body repair? Seems like TransLink is making WCR repaint shuttles before selling them off now. There are a few white GMC shuttles with telltale signs of previous ownership in the WCR lot and the paint looks super fresh, along with a Handy Dart that had the yellow part repainted black. I guess removing the vinyl from shuttles still leaves them looking too much like TransLink buses (and that's actually true because I've been thrown off by the shuttle Ace runs for Accent Inns).